2005: Where Am I? How Did I Get Here? Valentine's Day, 2011 from Bev Sykes on Vimeo. I dont usually write restaurant reviews, but I felt that the place we went to tonight needed one. I am writing this on February 16th for February 17th, the day I turn 68. Today was supposed to be Cousins Day, but Kathy asked if we could postpone it a day, which meant, of course, that I wouldn't be home for my birthday. Walt suggested that we go out to dinner and asked where I wanted to go. There is a new place that has opened up in the location of the old beloved Osaka Sushi. It's called Monticello Seasonal Cuisine and its emphasis is on serving seasonal foods purchased from local producers. I was disappointed that it had no menus posted on line, but that may be because the menu may change too often for that. 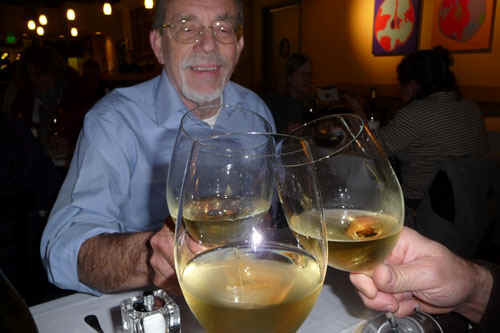 It only opened on January 11 and I first read about it in Davis Live Magazine, an on-line publication. I checked it out on the Davis Wiki and found really mixed comments about it. The general feeling seemed to be that the food was good and the service needed a lot of improvement. Ned decided to join us, which was nice. Before we left, Walt had to open a box from Shutterfly addressed to him, which I had resisted opening, thinking it was probably something Tom and Laurel had made for his birthday, which is next week. However, to my surprise, it was a book for ME (says so right on the cover). 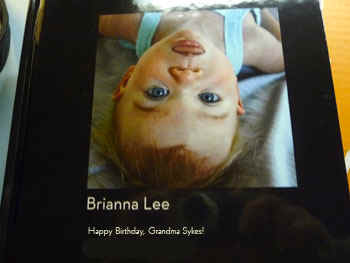 The book is a delightful collection of photos of Bri from birth to now. I told Walt it was a good thing that self-publishing was not as it is today when our kids were growing up or I would have run us into debt publishing books like this. I just love it. We met Ned at Monticello and were pleased with the remodeling of the old Osaka. 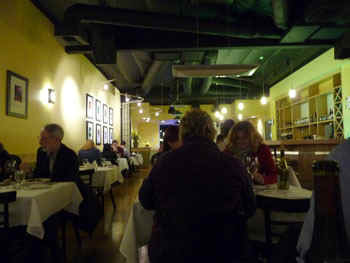 Instead of being dominated by a sushi bar, it now has a clean, open look to it, with a nice wine bar at the front. The Wiki comments about the slowness of the service were sadly true. While we were seated immediately, we were there for 15 minutes before we got water or bread. It was 45 minutes before our food came and we waited 15 minutes for the check. I should add that the place was only about half full and one table of patrons was seated, served, and left before we got our food. However, from reading the Wiki, I was kind of prepared for that and was determined to relax and enjoy. Ned and Walt ordered steak, I had lamb chops and I have to say it was the most delicious lamb I've had in a restaurant in a very long time, and perfectly cooked medium rare. Ned and Walt had the same comment about their steaks. A strange complaint is that they use some special salt in the shaker,but the crystals seem to be too big to go through the holes a normal shaker. My lamb needed salt and no amount of shaking produced enough to make a difference. 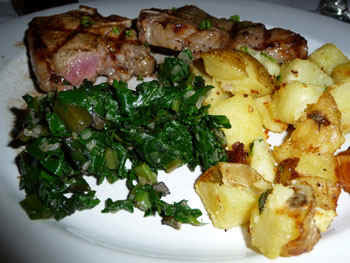 The potatoes and bok choy, however, were very nicely seasoned. I am not a big fan of bok choy and was pleased to discover that it was delicious. Since it was my birthday dinner and since comments on the Wiki raved about the desserts, I let Walt know I wanted dessert. I was surprised that there was no dessert menu, but the waitress rattled off four choices. 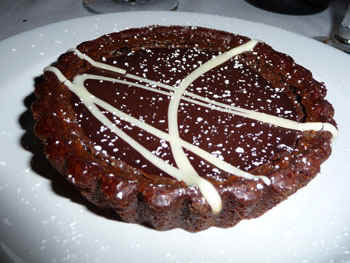 There was both a chocolate tart and a chocolate torte and I wasn't sure which I ordered, but we all decided to share it. I'm so glad we decided to share it because it was way too much for one person, even a chocoholic like me. But was definitely delicious. But the food was good enough to make up for the lack in the service area. I may give it another try, but not real soon, since the cost makes it definitely a special occasion dinner. I also wanted to add that I got a wonderful gift from Ned & Marta, who bought an order of bees through Heiffer International for me. That meant a lot to me, to know that someone somewhere will be able to pollinate their crops and harvest honey thanks to my birthday gift. All in all a really special birthday--and it's not even really my birthday yet! Cousins day tomorrow...next entry will be posted late.